Event hosted by the Centre for Spirituality and Cultural Advancement (CSCA) in partnership with the Network for a New European Generation. Interfaith dialogue is important because communities that are built on a shared set of values are the foundations of a strong society. In these present times, co-operation between Faith groups is crucial. The number of people who have Faith is growing, there is far more that unites people of different faiths than divides them. However, the exclusivist and sometimes hostile face of Faith cannot also be denied. There is a struggle in the world of Faith that reflects the broader struggle within society. This is a struggle between the open-minded and the closed-minded. In an era of globalisation, in which we are far more likely to share society together because society is becoming more diverse and the internet is creating a more global sense of community, the existence of such respect and mutual understanding becomes essential. That is why this task of openness to different faiths has to be undertaken, in part, by those of faith. They have to provide a) the platform for interfaith understanding and respect; and b) the theological and scriptural justification for the open mind and for investment in the good of others. 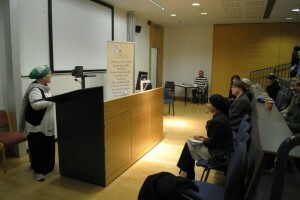 On November 29th, 2012, the Centre for Spirituality and Cultural Advancement, together with Network for a New European Generation, organized an event at the University College London (UCL) in London on “Peace, Harmony and Diversity: The Importance of Interfaith Dialogue”. The Event consisted of small presentations on the Importance of Inter Faith dialogue from our esteem guest speaker’s including; Shaykh Ahmad Babikir and Paul Salahudin Armstrong, with an enlightening performance by the Pearls of Islam. Hassen Rasool opened the event with recitation from the Quran; Sura Rum verses 22- 26, which highlighted the importance of humanity and acceptance of diveristy of colours and languages. 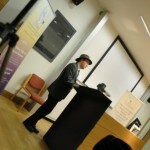 Paul Salahuddin Armstrong is a director, scholar and broadcaster. 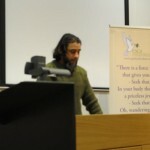 He is currently the Co-Director of The Association of British Muslims, Director of Heruset Ltd and Director of Khilafah Online Ltd, Paul has worked with and been a trustee of Wolver Hampton Inter-Faith & Regeneration Network, is a trustee of BME United Ltd and the founder of Wulfruna Sufi Association. Paul’s main message was how we should move towards a more peaceful and harmonious world, while celebrating our diversity- through interfaith activities and dialogue. Paul gave an example about the important positive affects interfaith work has had in facilitating good relations in Wolver Hampton, between people of many different faiths and ethnic backgrounds. He highlighted the fact that we are all members of the same human family. Paul stressed that the future of Islam and Muslims in the UK and Europe depends on the cultivation of friendships and increased understanding between people of all faiths and none, along with the relegation to the dustbin of ideologies intending harm to the health and wellbeing of the multi -faith communities and society in which we live. 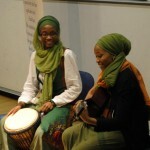 There was a lively performance by the Pearls of Islam, an acoustic female group. The performances echoed messages of peace, tranquillity and acceptance, their performances were thoroughly enjoyed by all attendees. Shaykh Babikir delivered his key note speech and his main message was religion is about piety, love, acceptance and sharing with everyone; religious or non-religious. Shaykh Ahmad Babikir, is currently the Imam of Yusuf Islam’s Islamia School and the Chairman of Ulfa Aid which is an international Relief Agency helping the poor and needy around the world. Shaykh Babikir denounced the concept that Islam gives Muslims rights above everyone else and highlighted the Islam actually is the opposite of this notion. Islam gives equal rights to all of human kind regardless of religion. Thus he emphasised that the relationship between Muslims and their non-Muslim neighbours and fellow citizens must be one of courtesy, mutual welfare, and cooperation for the sake of humanity. There is no compulsion to force one to accept Islam and we should accept each person for the way they are. Islam encourages embracing all and treating all people with respect and dignity. Fatima Akhtar, Chair of the proceedings, thanked all speakers for their enlightening and thought provoking speeches and invited questions from the attendees. 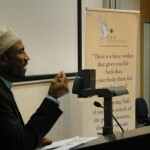 Over 30 people attended the event, and many commented that the programme was very positive and illuminating with important messages delivered that certainly are a step in the right direction to encourage positive relationships with people from different backgrounds and to reduce communal barriers that may have been created due to misconceptions.